2014 might be the year where the fashion world – from grassroots brands to mainstream retailers to high-end luxury designers – have begun to embrace ethics and sustainability. While there is still a long way to go, it is important to give credit where credit is due. After recent reaction to scandals and tragedies, such as the collapse of the Rana Plaza building in Bangladesh, there has been significant positive momentum via public pledges and promises by large corporations. Many have questioned how much of this is genuine and how much is green-washing. The true worth of these promises can only really be evaluated when followed by real action. In addition, many key companies have taken steps to improve their supply chains and working conditions, though there is still a lot of work to be done. Simultaneously, consumers have become thirsty for products that not only look good but make them feel good. All in all, all of this leads to a promising view of a more ethical fashion industry. We are excited to see what 2015 has in store for brands, retailers, designers and consumers as the focus continues to shift towards sustainability. On behalf of us at Shopanthropic, we are excited to wish you and your loved ones a wonderful Holiday Season & a Happy New Year! We hope the season brings you lots of joy and happiness! We are proud to have helped make 2014 is a year of ethical fashion, eco-friendly ideas and innovation, and as the New Year arrives, we cannot wait to see the ethical fashion movement continue to evolve. The idea is that grassroots brands can use data analysis to quantitatively share the stories and supply chain behind the items they sell. An example is using Google Maps to show where the materials and labour utilised to produce the item came from. In addition, there is a trend encouraging people to spend more time on retailer’s websites to educate themselves, not just purchase new items. 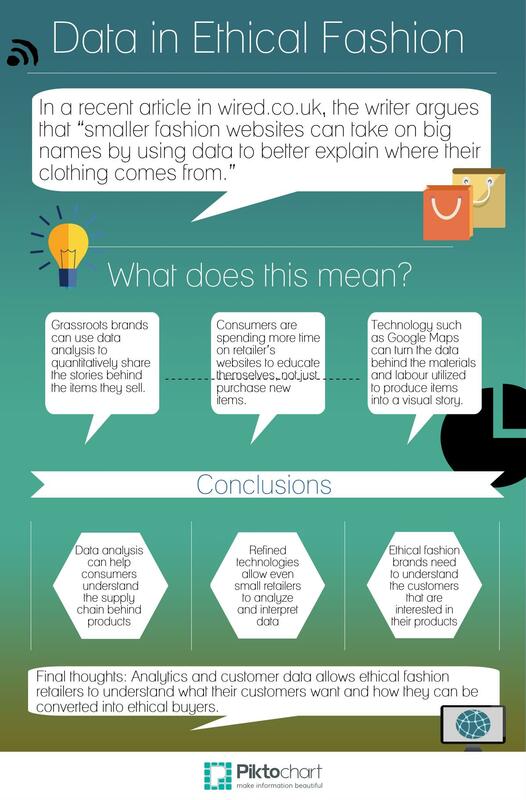 Analytics and customer data allows ethical fashion retailers to understand what their customers want and how they can be converted into ethical buyers.